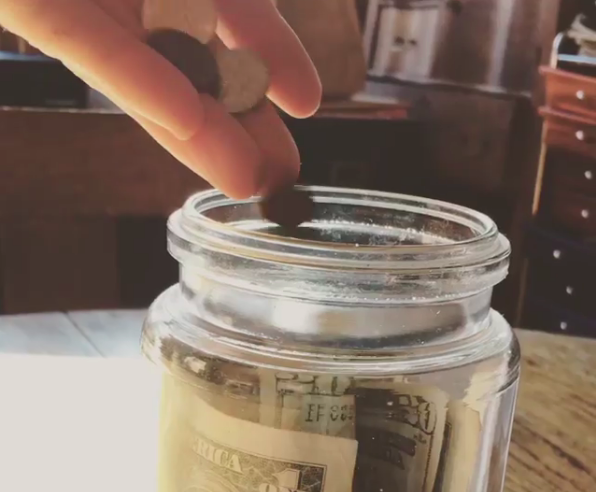 As longtime blog readers know, I run a Found Change Challenge, which is a fancy way of saying that I save up all the found money throughout the year and then add it up on January 1st. I encourage readers to do the same, and I’m always amazed to hear how much people are able to glean from their sidewalks and abandoned coin returns. My total for 2018 was $42.65, which includes one twenty and three one-dollar bills. 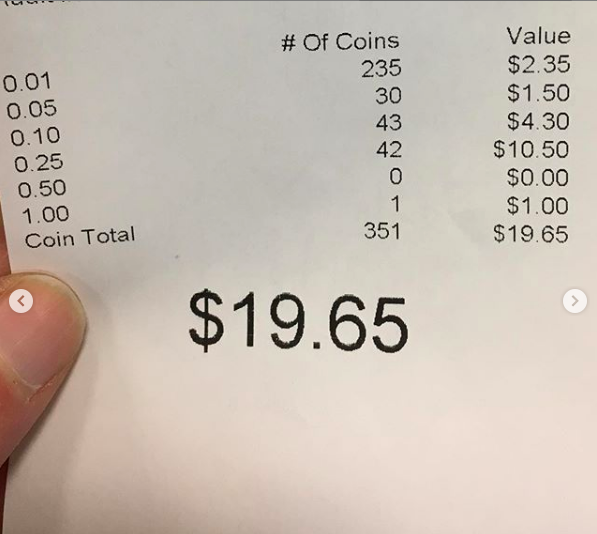 This receipt breaks down the different coins from my credit union’s free coin counting machine. 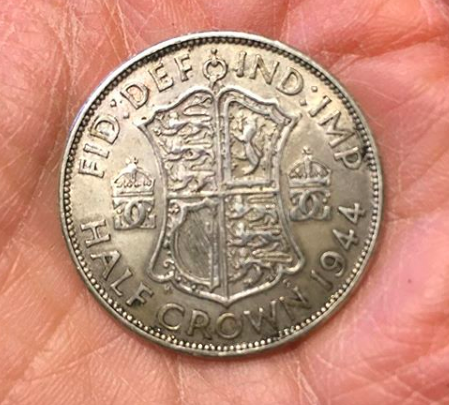 Of course, the machine rejected all the foreign coins, including this 1944 British half crown, which is obviously my favorite 2018 found coin! My 2017 total was $15.17. Great job, Katy. I have found a lot of change this year but failed to keep up with the amount. I frequently go to Kroger very early in the mornings and since I am often the only one in line, I will feed change in the self-checkout instead of using my dollars. I have a small purse so it helps it to stay light of my shoulder with less change. My kids are the first to spot any loose change! One just paid for a 48 count box of crayons with her change. My husband had no clue she meant she had $3 in change. Hardly any quarters either. He was so amused when she went to pay the cashier!!! In coins, mine was under a dollar and mostly pennies that went in our penny jar. I did find a $10 bill in the office that no one claimed, but gave it to the office cleaning lady when she ran out of SNAP funds before the month was over. I agree, and I would like to thank you as well for your generosity in giving the found $10 bill to someone in need. Well done Ruby! Nice to hear stories of compassion whenever I can. You made my day! I’m responsible for collecting the coin from my library’s passive book store. I do the Coinstar gift card for me and then move the correct amount of money from my checking account. What I love about CS is that the silver coins do not process. But neither do the foreign coins. After three or four years of this, I now have quite the collection and have no idea what to do with them. Anyone have any ideas? A coin dealer might give you some money for them. An Etsy artist who make coin jewelry might like them as well. And both containers and found change are off to a good start in 2019. In particular, I found a dollar bill this morning, so the found change for the new year is at $1.49. Woo hoo! The best part about the change hunt is that it’s giving DH much-needed mental exercise: Even he is scanning the ground for change now (and picked up a dime in the Wegmans parking lot on 1/3). Trust me, it’s a lot more fun for him than Sudoku. Your love and care for your husband inspires me every time you post. You are really something special. My 12 year old son and I do this with all the proceeds going to him. $10.56 in change. Not a stellar year but a little more in the savings account for his 2020 Europe trip. I wish that half crown could talk; love to know how it ended up in your neck of the woods! In 2018 I found $48.41, most of it was found in the first half of the year (including bills). I don’t have yearly records before that. Thank you Katy for convincing me to keep annual records of this fun past time. $11.35 in total this year. 58 of those were dimes. I found other coins not included in that total. Jamacain dollar, a Chinese or Japanese coin and a bunch of coins totaling about $3. That half crown is 50% silver. It has a bullion value of about $3.50. 1. Starting off the year by using up food in my cupboards and freezer. 2. Have been picking/eating organic veggies from work — they are free to me. 5. Need to stop focusing on food if I want to lose weight this year. I am going to claim just over 18.00 in change AND a 10 dollar bill… but I definitely cheat in that it also counts any spare change I get through the year. It’s extremely rare for me to use cash so if I stumble upon it, into the jar it goes. I can’t believe you found a $20! $31.76 including one $20 bill and one $1 bill. This is 2/3 what I’ve found in the last two years. My family thinks this is due to more people using pay pal, venmo, etc. Essentially not carrying cash. This was such a fun challenge! $23.77 was my total. That included 1 one dollar bill. I did have help from my husband too! I do sometimes find foreign coins in the CoinStar, which I give to my husband. I don’t count them as I don’t redeem/spend them. I don’t do a change challenge, per se. Hubs and I just wait until the change jar is full. Then we take it to the bank’s free coin counter, and add the funds to our account. I think the best we ever did was $40 in coins. Not bad, eh? It just goes to show that the little things really do add up. 43.61! But funny story, we only started this last year. So to make it a bit more fun, before we count our change, we all take a guess on how much is in the jar. This year my Husband, guessed 43.61! How did he do that?!?!?! I also had 1-20.00 bill and one single. My daughter and I have fun hunting all year for change! We are in a very rural area so change on the sidewalk is hard to come by (as it would necessitate a sidewalk 🙂 ). Like A. Marie, most of my “found money” comes from picking up returnables on the roadside and redeeming the bottles and cans left by renters in our short term rental unit. My goal for the last two years has been $52.00 (or 1 dollar for each week of the year). This year my total was $49.05. This also includes the small number of returnables we personally have during the year and any loose change I do manage to find. (The car wash in town is a good spot for pennies.) Based on my record keeping it looks like $33.40 of that total came from ‘found’ returnables. Our ‘found money’ most frequently goes to paying for trips to the movies or to the ice cream stand in our village. My Nana picked up every coin she could in her life and DS is now an avid coin finder. So when he finds a penny he often says Grandnana sent it for him. It makes my heart happy. $4.03 for 2018. I told my friends to keep dropping their change in 2019. I’m not too proud to pick up their money!!! Found $114.32 in 2018. Part of this was $76 (bills) while walking my dog. On average, I find about $70 a year so this past year was a good one! All found money is going in to a college fund. 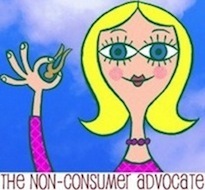 People must skip down the street flinging money with abandon in your area. I average about a dollar a year and I look all the time. This actually made me LOL! I could imagine someone skipping down the street just tossing money left and right! I decided to keep track this year and have found a penny. A friend found a crumpled $100 bill in an airport the other day. So far this year I have found 1 penny…. 1. I found $20 bills on THREE separate occasions (including on hiking trails). 2. Coinstar machines were added at several new locations in our area last year, and people were not checking for returned coins. I remember finding $6 in quarters on one occasion, and over $7 in change on another – as well as many smaller amounts. Now that the machines have been around awhile, finding coins in the return is a lot more rare. I had $31.17 this year which was pretty impressive for me. I can’t tell you how much of that was just people who didn’t take the quarters out of their Aldi cart, but it was probably at least $10! It’s like throwing money away! I don’t get it! I leave my cart quarter behind sometimes on purpose. To be nice. A pay it forward kind of thing. Sometimes people give me their cart too, that they are returning, and they don’t ask me for my quarter. I think a lot of people notice that they had dropped change, but could not be bothered to pick it up. Likewise, I am always amazed while shopping at Aldi’s at how many abandoned carts are the parking lot. I sometimes round up a couple near ones and pocket a quarter each. My husband and I found $12.95 – I think about half of it was found when he was cleaning out a rental house and the people just left it on the floor through the house. I am always tickled to find ANY money. Sometimes friends ask, as I am squealing and bending down to pick it up, “Is it Heads Up?” And I say any Found Money is Lucky. I do Mystery shops at my bank once or twice a month and need a “reason” to talk to a Teller so take coins from my husband’s dresser in to the free bank counting machine pretty frequently. This year I am going to keep track. Does money I find on my Teens bedroom floors in and the laundry (from my own family) count? This year it does! I agree with you, Jen, any found money is lucky! My hairdresser lived in a house she was convinced was haunted because pennies kept appearing everywhere. One time she got out of the shower, wrapped a towel around herself, and a penny fell out of the towel. Must have been a frugal ghost! My vase full of found coins is sitting on the kitchen table, waiting for me to count it (and write about it on my website). I find a lot less since moving from Seattle to Anchorage, Alaska. Here’s what I do: Count it up, then round it up and donate it to the food bank. This year there’s likely more need than ever due to the federal shutdown. In the past I’ve suggested that people use their findings as seed money for an emergency fund, or any other financial goal. How do you use yours?